It's not perfect but it sure is one heck of a lot better! How did you guys do on that? If you got it done, make sure you leave me a link to check out so I can give you some comment love! Plus, cleaning is more fun when you do it with friends. It's not really a junk drawer. It's all kitchen items. I just don't remember what the heck is in there anymore. That means it's time for a clean out and most likely a serious purge. If I don't remember having it in there, chances are I haven't used it in the 2 years or so since I put it in there! That's it for me for today. It's another crazy busy day and I need to scoot! Let me know how y'all do! You know I care! 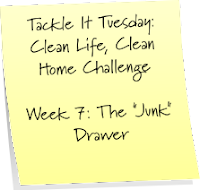 New to Tackle It Tuesday - Clean Life, Clean Home Challenge? Don't worry! Just jump into this week's challenge. Be sure to come back and post your blog links to celebrate your progress and achievement!